What is AZOC On the Go? AZOC On The Go is like a bookmark that simply sits on your browser's toolbar and gives you 1-click access to the fully-featured AZOC database of safe online casinos, at any time. View casino cashout times, licensing jurisdiction, ownership details, trust-rank and much more with the ability to do fast side-by-side comparisons. 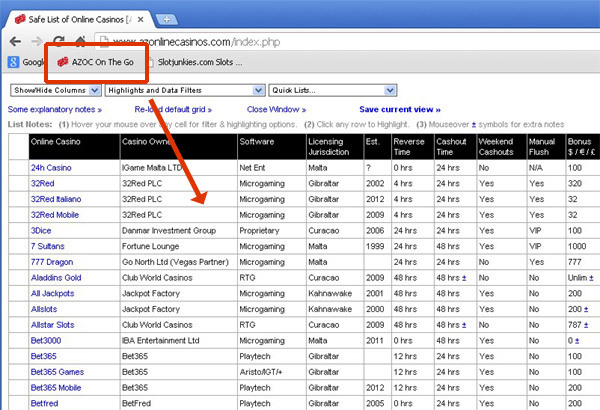 The AZOC Casino DB contains a lot of background information on some 150 safe online casinos that I have played myself over the years. I've actually played a lot more than what you see but I only add the casinos I consider safe. The crap ones get discarded! Every now and then I revisit them or update the information from feedback supplied by other players so it's generally pretty accurate. I play at quite a few regularly too - you'll see a list of those I consider the best in the links below.